Paratha, stuffed with ingredients of a decidedly English nature. This, like the recipe for English Samosas shows how you can take a basic format and modify it to make whatever you want out of it. Here, we take the spiralled spiral paratha and change the ingredients to suit our taste. 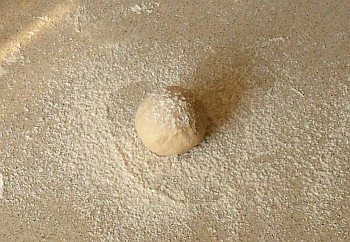 Mix the flour and water to make a dough with a soft consistency. Roll it into a ball and and put it in a bowl. Cover it with a clean dry tea-towel and let it rest for around 20 minutes. 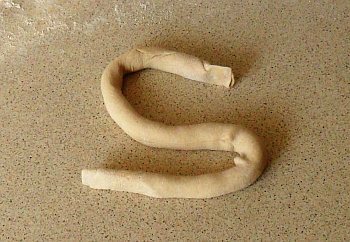 Roll the dough into a cylinder shape, around 5-6cm in diameter. Cut this up into 6cm lengths and then, divide equally what is left between these and roll into balls. rolling-out now, before you put the filling on it. Take one of the dough balls and roll it out. It doesn't have to be round, in fact, the more rectangular you can get it the better. In the following steps, you are going to be rolling out the dough with a layer that has water in it - this will tend to mix the layer in with the dough. In order to reduce this to a minimum, you can do a lot of the rolling out before you put the filling on. leaving a border on three sides. 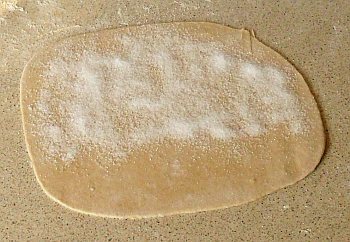 Sprinkle some caster sugar onto the dough sheet, leaving a border at the bottom. If you can't get hold of caster sugar, you can use normal granulated sugar instead. Sprinkle a few drops of lemon juice onto the sugar. Don't add too much because you will just create problems later on with mixing if you do. You just need enough to wet the sugar. remove as much air as you can. Slightly dampen the border with a few drops of water. Roll up the sheet, starting at the edge with the sugar right up to it and finishing at the border you left at the bottom. Try to roll out as much air as you can, without damaging the dough roll you have just made. 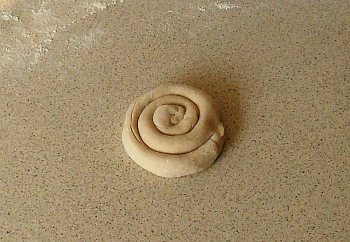 You can stretch it out a little, so that you end up with more spirals - note that stretching it doesn't involve as much rolling as flattening it with a rolling pin. Roll the roll to make a spiralled spiral. Roll the roll up into a spiral. Gently press the roll flat, just so that it takes up the spaces between the coils on the top and underside. Sprinkle a little flour on the roll and turn it over, sprinkling some on that side as well. - not too thin though. 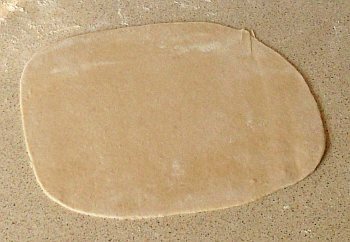 Start off by pressing the spiral flat using your hand - this is a lot more controlled and a lot gentler than using a rolling pin. It is almost inevitable that you will have some air pockets in the spiral and they will burst out, leaving a damp area behind. When this happens, just sprinkle some more flour over the paratha and carry on. 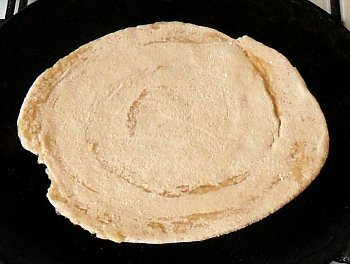 Continually turn the paratha over as you flatten it, checking for and treating any leaks that occur. When you have got it as flat as you can using your hands, use the rolling pin, a little at a time to get it the size you need it to be. 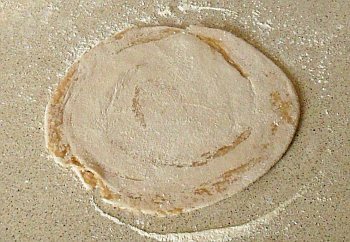 Don't roll it out too thin because you want to maintain the layers in the pratha. 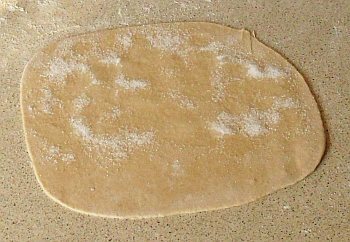 If you roll it too thin, the filling and the dough will become mixed up and you will lose the layers. Fry on a hot, oiled tava in sunflower oil. Carefully put the paratha onto a hot, oiled tava. Whilst the first side is cooking, sprinkle some oil on the top side. Being a sweet paratha, you should really use an oil that doesn't have a lot of flavour so instead of using the usual olive oil, use peanut or sunflower oil instead. Fry both sides until it is just right. Turn the paratha over - so that the uncooked side gets a chance. Unlike roti, you can turn this as many times as you like so if it isn't as brown as you want, just give that side a bit more time in contact with the tava. Once it is finished, it should look something like this. 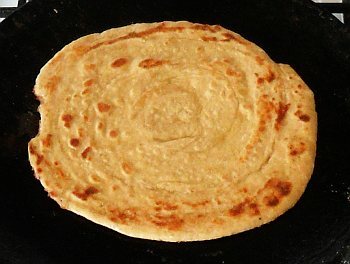 Below, you can clearly see the spiral in the edge roll of the paratha. With the space between the layers being s thin, you can use ingredients that are actually quite runny, without losing them when you eat the paratha. You can see the spiral in the end of this cross-section. Each layer is thin enough to hold it in place.